← Wynochee River Canoe and Camp! Our Court of Honor is scheduled for Thursday, May 29th, starting at 6:30 p.m.. It will be held at River Ridge Covenant Church at 7945 Steilacoom Road Southeast, Olympia, WA 98503. Michael is the Master of Ceremonies for this event. The Meal them is ” What is your Favorite Dish?” Please bring your favorite main dish or a side dish. Enough for your family and to share. The Troop has always adhered to a conservation minded events and requests that people bring their own (washable at home) dinnerware. 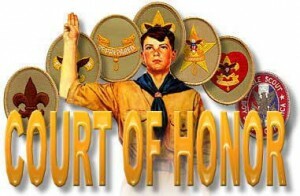 The Court of Honor is a Class A event, and Scouts should wear their Shirts, Scarfs, Ropes, and Sashes. Michael will be contacting a few selecting Scouts for assistance during the Court of Honor. We have lots of awards earned in the last six (6) months, so it should be a fun time.